And now, on to the Women's portion of our 2013 The Trials Preview. You've likely already seen it, but if not, check out Part I. 2014 will see a new representative for Canada as Calgary's Cheryl Bernard was ousted in The Pre-Trials (aka Road to the Roar). A tough loss for Bernard over Val Sweeting, also from Alberta, after stealing two in the 8th end to go up 7-5, a deuce in 9 and steal in 10 sent them home. Three of the 8 teams are from the Wild Rose province, indicating its depth in Women's curling. 7 of the top 20 teams on the Tour's Order of Merit are from Alberta, but only heather Nedohin is in the top 12 (5th). Because of the smaller sample size, I've added a new statistic. Using Bill James Pythagorean Theorem, I've calculated the Predicted Winning Percentages against the field. For curling, the exponent of this formula is 2.72 and you use the ratio of PF/PA because there is no set amount of games played in a season for all teams. For the Men the Pythagorean was not a surprise, Howard (67.4%), Martin (57.5%) and McEwen (54.3%) were the only teams with an expected winning percentage over .500. Interesting that Stoughton and Epping have lower expected wins based on this formula. Stoughton drops from 3.4 to 2.98 and Epping drops from 3.66 to 3.24. The caveat is that our calculation on P/G (points per game) do not adjust for 8 and 10 ends games. This may sway the numbers slightly. A good team that beats good teams consistently, shocking they haven't been to the Scotties since 2009 (and 2005 before that). Perhaps this will be the event. - Lawton has a winning record against everyone in the field (6-6 against Nedohin is only .500 mark). - 16-8 (9-2 since 10/11) vs Jones and 4-3 against Homan. - Lawton's scoring ratio of 1.2 is highest with Jones far behind at 1.13 (trust me, it's farther than it looks). 5.96 PF/G versus 4.99 PA/G, the only team that surrenders less than 5 pts per game (depending on which digit you round up). - The highest scoring team at this event generating 6.17 PF/G. This is likely skewed by more play in the Scotties and hence more 10 end games, but it's still no surprise. - Lawton is the only team that gives them fits (see above), and a surprising 5-2 against Homan since 10/11 is a small sample but still of interest. - Jones is 51-42 (54.8%) historical and 30-25 (54.5%) since 2010/11 against this field. When this team plays it's best there are many who think they cannot be beat by anyone. This is more because of their style than their actual record. Teams that appear to stop other teams from scoring (see Kevin Martin when up 2 points) just seem more dominant than those that score more (see Howard, Jones). Having said that, they are a great team that dominated at the 2013 Scotties and were a whisker form being in the World final, and only going to get better. - Homan is 4-7 against Lawton and Jones since 2010/11 but still 22-17 (56.4%)overall against the field. - Their 5.5 PA/G and 1.06 Scoring Ratio is not as great as many might have guessed. Homan is great against good teams, but against this field they appear to actually be mortal. - Remove Sweeting from their record and they are 19-17 since 2010/11. The 2012 Scotties Champion is 5th on Order of Merit and the lead contender of the remaining teams. They are the only other team with a winning record against this field. - 32-26 (55%) since 2010/11 against this field. The other home town hopeful (Jennifer Jones being the other), Carey is 8th on the Order of Merit and defends enough to win. Can they score enough is the question. - Scoring Ratio of .97 is solid and shows they can battle these teams close. - 5.32 PA/G is 2nd to only Lawton, but their 5.15 PF/G is is second last and a full point behind their provincial rival. - 4-12 against Jones since 2010/11. Remove Jones and Carey is nearly a .500 team against the rest of the field. But they will have to play Jones at least once during the week. Like Lawton, they experienced a crushing and unexpected defeat in their 2013 Provincial finals. They were hands down the best team at the Road to the Roar, rebounding from their A Final loss to Scott by winning the B event and beating her in the 1st Qualifier 12-4. Can they contend for this event? - 11-16 (40.7%) since 2010/11 against this field and 18-28 since 2003. - Can win against every team at the Trials. Only 2-5 record against Nedohin of late jumps out. - Scoring Ratio of .86 will have to improve. - Scoring ratio of .84 is second from the bottom, and it includes all games. If we looked since 2010/11 I expect it is worse. - Has no record against Sweeting. Winning record against Nedohin and can beat every team there. - Lawton appears to be her nemesis with a 5-11 record and 0-4 since 2010/11. If Kelly Scott had won the last qualifier, I expect she would be ranked higher. But she didn't. Team Sweeting once again surprised in an event she was unexpected to win (see 2010 Alberta provincial). - 9-19 since 2010/11 against the field is only one victory different from Sherry Middaugh. - A dismal 4.81 PF/G against this field and a Scoring Ratio of .79 are both well below the competition at this event. - No wins against Lawton (0-4), Homan (0-3) and 2-5 against provincial rival Nedohin. Those numbers will have to head in the other direction if Sweeting is to make a run. As mentioned, sample sizes are much smaller than the mens as these teams simply don't play as often against each other. Let's look at Expected Wins based on both Record against the field since 2010/11 (EWR) and Points for/against , using Pythagorean theorem (EWP). Despite their lack of success on the big stage, Lawton is the team to beat statistically. In 2009 they lost in a tie breaker at The Trials. Perhaps this year will be different? In 2009 there were 3 teams at 4-3 and I expect several again this time. Bernard's 6-1 was a phenomenal run and I also wouldn't be surprised if one of the favorites manages a similar feat to secure a spot in the finals. Late in that week, there was also a chance that of a 5 way tie at 3-4 and 7 teams making the play-offs. Wouldn't that be something? Look for favourable odds on Lawton and watch for poor odds on Middaugh based on her historical numbers. Two evening draws during the Round Robin for the women with Wednesday being the Big Night with Nedohin vs Lawton and Homan vs Jones. The four teams we should expect in the play-off, but stranger things have happened in the past. I wonder who was it that came up with "Roar of the Rings". The name was apparently first coined at the 2001 Olympic Trials. If I recall, that was also the year that Rudy, now all grow'ds up (but still looking 16), became Samwise Gamgee and a young Huckleberry Finn became Frodo Baggins in a Tolkien tale of a very similar name. Warning, if you played Dungeons & Dragons or dress in costume when you go to movie premiers, repeat watching of this Frodo/Sam Youtube clip may send you out for extra Scotties tissues to absorb the tears. Is this a Canadian thing that we always jump on the latest movie craze and name things after it? You could make a case that all of these definitions apply to the upcoming Trials in Winnipeg. Number 3 perhaps most of all. I'm someone who likes the fact the British Open is actually The Open Championship (and not the Battle of Tipton "Green" ) and the winner is named The Champion Golfer of the Year. 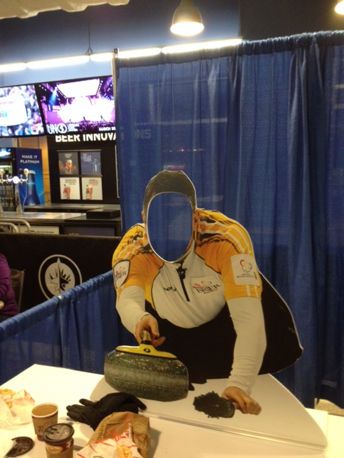 Perhaps the winner of the 2013 Trials could be the Champion Curlers of the Quadrennial? With Tim Horton's as the sponsor, perhaps it should instead be the Roll up The Rings or Roll up the Rink? Enough preamble, let's get on with the Preview. 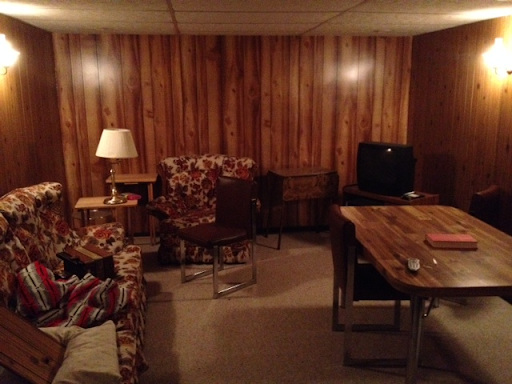 Mens Preview in Part I. Women's Preview coming up in Part II. Glenn Howard. You could make a case that there are no favorites, and you'd probably get me to agree with you. But who wants an event without putting at least one team on the dart board? - Howard is historically (all time) 131-72 against this field (64.5%) and 75-38 since 2010/11 Season. - Looking back to 2009 Martin was 110-66 (62.5%) and 76-35 (68.5%) coming into the Trials for Vancouver. Eerily similar. - Their record since 11/12 (with a few events the season before) includes the SAME TEAM. McEwen has been together longer and Koe is the next closest. - Glenn has a winning record against everyone except Martin, and 6-8 against Kevin since 10/11, including a win this years Masters final. - Has a new third (Dave Nedohin) and has struggled with some health issues. Historical record is still 122-77 (61.3%) against this field and 51-40 (56%) since 10/11. Some could make the arguement that adjusting to a new third drops their chances even lower, but I'm not prepared to count Kevin out. He's shown he can win with different teams over the years and despite limited playing time, they've already shown they can compete and win against the best in the world. - 2-6 against Epping is a strange number that could be due to randomness or Epping's purchase of a KMart Voodoo doll (made available during the 2010 Olympics). - 67-71 (48.6%) historical but 58-49 since 10/11 (54.2%) against this field. A winning record since 10/11 against all teams except Howard (6-12) and Koe (8-13). - 14-7 against Stoughton includes heartbreaking loses in Manitoba Provincials, but on Tour Mike seems to have Jeff's number. Their Round Robin game will have the home crowd cheering both ways I expect. - 73-92 (44.2%) and 50-58 (46.3%) since 10/11. Take away his record against Howard (3-13 since 10/11) and the percentages jump over 50%. Of course the one game Koe won against Howard in the 2010 Brier final, means more than all the other loses combined. Cotter/Morris. Take that record out and Jeff drops to 44% (comparable to his historical record). - 2-5 against Epping. Hmmm yet again. Based on recent results you could make a case that these next teams are also Contenders. But then we wouldn't have anyone in this section, and that would look odd. If you like to bet curling online, look for good odds on both these teams. - They have a record of 34-33 since the 10/11 Season, including 5-2 (Stoughton), 6-2 (Martin), 5-1 (Jacobs) and 4-1 (Morris/Cotter). They can beat every team at the Trials but John has still only won one Grand Slam event (Players in spring of 2012) and switching up his line-up at the end of last year may not be the answer. - Yes, they are the defending 2013 Brier Champions. But this isn't the Brier and their record against this field is 27-38 (41.5%) since 10/11. Remove the 7-2 mark against Morris/Cotter and it drops below 36%. - Their sample size with John as skip is small. Combined Morris/Cotter is 19-52 (26.8%) since 10/11 against this field. - With their fine showing at the Road to the Roar, you could argue them to be a Challenger. But like a favorite, every event needs an underdog and this team is it. I give them a much better chance than Gunner in 2009, they have big event experience and an Olympic champion holding the broom. Let’s examine chances of outcomes. These are based on handicapping analysis I have done. I used a combined weighting of historical and recent (since 2010/11) numbers. I will spare you the details of the numbers, other than to say if you’d like to bet on any games, please let me know. Howard: Expected Wins(EW) is 4.80 and 6.9% chance to go undefeated (U). Numbers would indicate this event is way too close to call. Also, additions to teams (Nedohin to Martin, Mitchell to Epping, Morris joining Cotter) skew our analysis somewhat. All of the teams at this event have experience and skills to beat anyone in the world. This event may come down to a a handful of shots at the right or wrong moment. It will be a very gruelling contest which requires absolute focus and concentration while maintaining physical condition. It will be interesting to see if the stamina of the younger teams combined with their recent success will overcome the confidence and experience of the older squads. I am making no predictions other than I expect at least one tie-breaker and many gasp moments throughout the week. 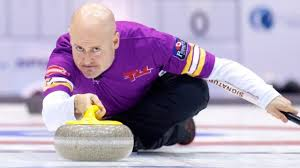 Not certain if Team Koe are Vikings fans (but I am) and today they were the only team in purple that managed a victory. The Vikings are now playing for a draft pick (2-14 here we come!). 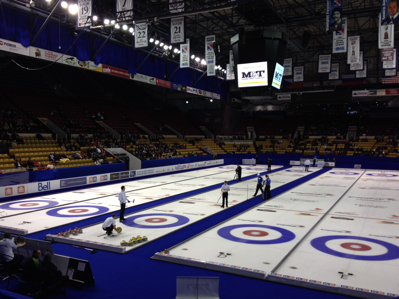 Koe managed a 5-4 win in the final of the 2nd Grand Slam of the season, the Canadian Open. 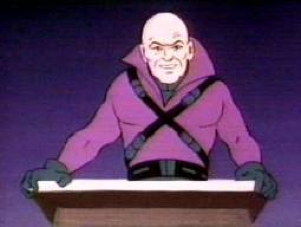 Strange that I hadn't noticed before but with these new uniforms, Kevin Koe bears a striking resemblance to Superman's arch nemesis. "Smile Kevin" asks David Amber from CBC. But what diabolic thoughts were hidden behind that evil grin? It was an entertaining contest with many interesting decisions which could be broken down by Curl With Math. Unfortunately, in addition to writing an e-book I am working on a research paper to be submitted to the Sloan Sports Analytics Conference. Deadlines are approaching and the clock is ticking. There is no time for lengthy analysis that will be debated by both of you reading this, but I have time for a few comments. 1. Koe had no choice but to try the in-off hit in the 4th end for a possible three. Gushue in fact wanted to be lighter on his draw to avoid leaving this shot and have Kevin draw for one. 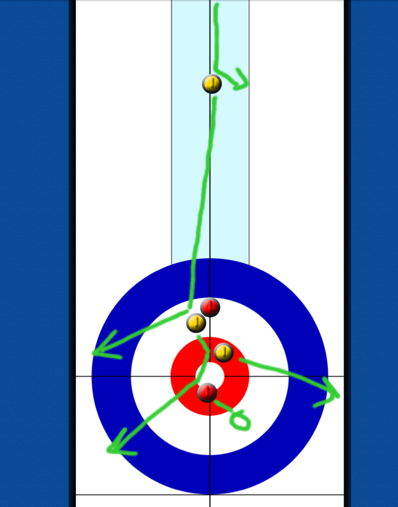 Even if Koe had an easy shot for 1 he would only need to make this shot around 40% of the time to be worth trying. In fact, given he will often still get one or even two, it could be the right call if he makes 3 even half that often. 2. During the blanking of the 4th end by Koe there was discussion on this decision by the announcers as they tossed around some statistics (care of CurlingZone). I've touched on the 2 hammers to 1 theory before, but we've only scratched the surface of digging into the numbers. The research paper I am preparing may answer this question once and for all. 3. Koe scored his deuce in the 5th end with the help of a missed corner guard. Because guard attempt by Carter barely came across center, Gushue decided against peeling it. Strange sometimes how a miss will create a favourable situation that was unexpected. In retrospect, maybe Koe should throw an off-centre guard as a way to entice Gushue to play into the rings. 4. More in the 5th. Gushue attempted a double on his last shot but could have chosen a freeze instead, leaving a difficult shot or even no chance at two and have some chance of a possible steal. Maybe Gushue was thinking he'd rather have a blank here and possibly get hammer in the last end (see number 2 above). 5. 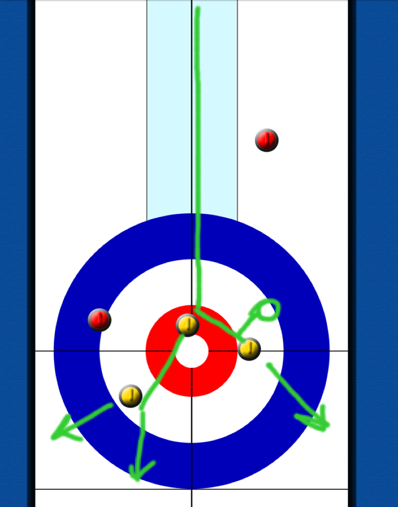 Interesting scenario where Gushue on thirds first rock has to decide on playing a peel or a guard. You don't often hear that discussed. A very interesting end that was only surpassed by..
6. The Final end. I can't recall seeing such a strange turn of events in a final tied end. Both tick shots were made but an unfortunate jam gave Gushue hope. This hope was then quashed by Lex making and in-off hit for one to win the game. It was nearly identical to the shot attempted in the 4th end for three. 7. Anyone notice the Saskatchewan Roughriders fans cheering to the camera? It almost seemed like the Grand Slam had some real live excitement and then I realized they just wanted to be on TV. Why else would you paint yourself for another sporting event that you're not attending? Coming soon: Olympic Trials Preview. John is not the first non-resident resident to compete in playdowns, and will certainly not be the last. The exposure on this ruling has many people on the Curlingzone forums arguing/discussing/trolling about the fairness of this decision. Many are opposed and extoll the history of the Brier and its sacred Purple Heart as a symbol of true provincial victory. Others see it as no big deal, 3 out of 4 or 75% of a team being provincial isn't bad, is it? Alberta/BC/Sask borders have long been adjusted for Brier playdowns. Players in BC play in Alberta and players living in Alberta play in Saskatchewan (or maybe it's the opposite, in any case there is some overlap of territory). With CTRS and ultimately Olympic Trials qualifier points given for Brier and Worlds it seems contrary to fair competition that some teams (those with 4 residents) have an opportunity to gain points when other teams cannot. Is it reasonable to assume that the best representative of Canada, be it at Worlds or Olympics, would come from the same town/province? With relegation and Team Canada in 2015, the Brier is changing. Its become too big and too political to do anything else. I'm not sure how to defend either side to this argument. I like history and I don't like it changing for the worse. Instant replay in baseball seems like a problem, but if its incorporated properly it may come as a minor element that actually improves the game. I'm a realist and a sentimentalist, often these two philosophies clash. 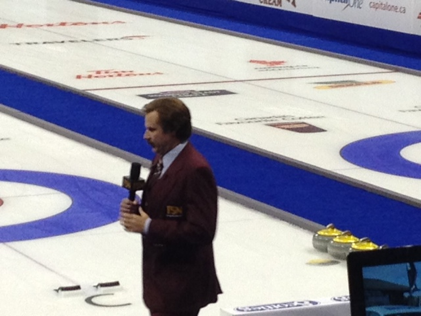 The Brier is still the biggest there is. It's still Alberta vs Saskatchewan, Ontario vs Manitoba. John playing in BC or Pat Simmons in Alberta doesn't change that feeling for the average fan and it likely doesn't greatly impact other teams chances at their local provincials. Cotter's team is good enough to get out of BC without Morris. Isn't the idea of playing for your home club/town/province more for little league anyway? Grown men who are raised playing basketball in LA don't necessarily play for the Lakers. Maybe provinces should start to recruit players in an attempt to be more competitive. PEI could set Mike McEwen up with a nice cottage on the water and a part time job at the local pub. 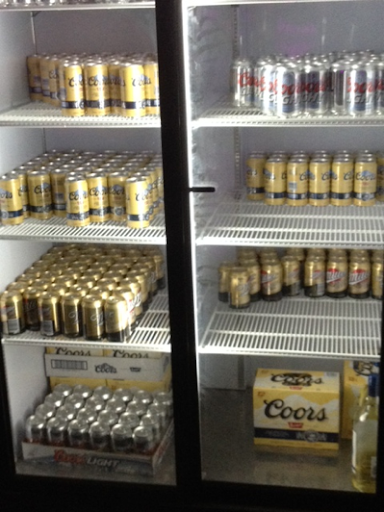 With relegation, this might become necessary to even participate in (the round-robin portion of) the Brier. I know, you are shaking your head but pause and think about it one more time.... it could happen. Now, if we start to see 4 young kids from Manitoba take "residence" in the Yukon, maybe people will become more vocal about this behaviour and things will change. For now, the average fan could care a less if their provincial rep has a single mail-order player on their squad. The players involved will have their own feelings and if John Morris should wear a Purple Heart from his third province, he'll know if it feels any different than the ones from Alberta and Ontario. After losing the last qualifier spot to Brad Jacobs, 2006 Gold medal winner Brad Gushue will be the 5th man for Team Kevin Martin at the upcoming Roar of the Rings. If this means that he won't be able to compete in Provincials or the Brier should they win the Olympic spot, then it's possibly a poor decision. Brad has a young developing team and it would be disappointing not to have them gain more experience together and possibly make a run in Kamloops. If he is able to play in the Brier, then it's a great opportunity to learn and gain experience from seeing how Kevin Martin (and David, Marc and Ben) go about their business. Some part of this decision feels detrimental to Brad's team, but if the commitment doesn't challenge their schedule, it could be better for them in the long run. I was fortunate to be live for the final game of the 2013 version of the pre-qualifier to the qualifier for the Olympics. Here is the view from my seat. Notice the overhead jumbotron is NOT showing TSN. Apparently the sponsors wanted that space for themselves. I would not have given in to this type of request and tried to appease them some other way. Having an overhead view of the house is great for the fan and not having it makes me want to watch at home. The final was an entertaining and well played contest. Jacobs was in good position early with a deuce, then surrendered two steals to go down, rebounded with a three and then held out for the win. Something I noticed from Gushue in the morning draw reminded me of his tendancy to call difficult shots for himself when it isn't always necessary. He chooses to play a peel on the red rock sitting second stone. A much easier shot would be to hit the rock in the top twelve foot. Gushue makes the shot, pushing his shot yellow stone to the back button. Laycock is then left with another freeze attempt. He comes a foot heavy and Gushue then plays a straight back double for two, and makes it. The result is a blank, the best outcome possible other than a steal. Gushue's chance to win goes from 90% at the start of the end to 93%. If Laycock had scored two, Gushue would have dropped to 83%, still a dominant position. If Gushue had missed or just clipped the top rock, leaving it in the rings, and brought 3 in to play, his odds could have dropped to 64%. The chance of this happening is, granted, very small, but why introduce the risk? 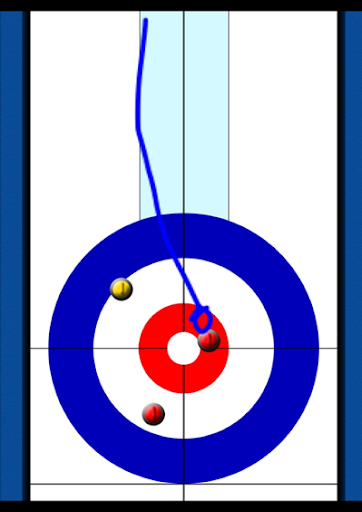 Even making the shot, if Laycock had thrown a better freeze, Gushue would have been forced to peel the top and surrender a deuce, or possibly risk jamming the run back and giving up three (wonder which shot he would have called). The shot called didn't appear to improve Gushue's chances enough to justify the risk he was introducing, even though the outcome still was favorable. Fortunately for Brad, he is a great player and makes a lot of shots, but this scenario reminded me that he sometimes makes it harder on himself than he needs to. Note, this graphic has not been confirmed as correct. I was at the far end of the rink and did not recall the exact position of the house. I had a Tivo malfunction, the game was not recorded and the soon to follow analysis is subject to scrutiny if the location of the rocks are different than shown. If you recorded the game please send me a more accurate diagram. Gushue decides to draw and freeze for third shot (green line). He makes a great shot. Jacobs then places a guard in front of the rock Gushue just threw and Gushue is left with no choice but to draw for a single. Perhaps he thought Jacobs would try a peel on the red rock, maybe even try to make a difficult double. Gushue needs to take chances. Even a deuce only puts him tied coming home without hammer, a 20% proposition. Maybe he was trying to entice Jacobs into something and hope for a miss and possble three. 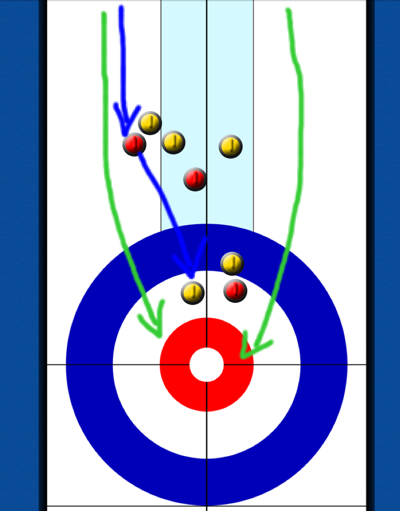 If Gushue had chosen to draw for shot stone (blue line), he forces Jacobs to make a play on the rock. When deciding what to do with the 14th rock of the end, skips must always consider the risk of not being shot stone and what options that leaves their opponent. I wonder what Brad was thinking on that shot decision. Not only did I screw up the house, I didn't even have the correct colour of the rocks! Clearly I was not paying enough attention at this stage of the game. Much more understandable now why Gushue would choose to freeze to that rock. I'd like to blame the event and their lack of overhead camerawork, but more likely this is simply a mistake on my part. Some part of my analysis however still holds true. Gushue threw a freeze and was second shot. As I stated, consideration must be made of what the opponent might do if you choose not to be shot stone. 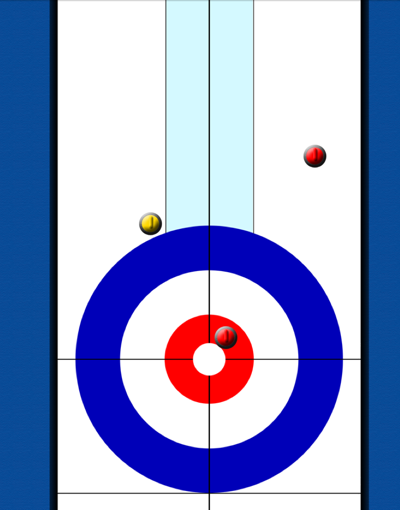 Jacobs could have tried to pick out the yellow rock that was frozen, though he would likely loose his shot stone and Gushue could hit for two. 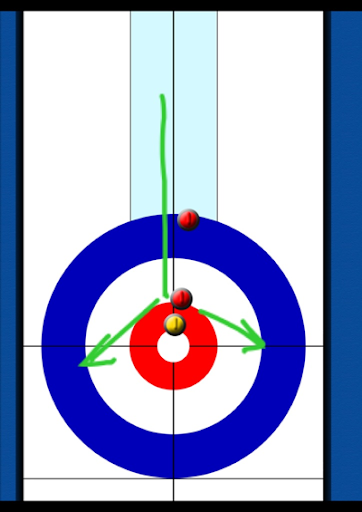 He could also choose to hit the open red stone but then Gushue would have a simple shot for two. By guarding, Jacobs made it impossible for Gushue to get two with a made shot and his only risk in missing was leaving a shot for two, not for three. Possibly Gushue was trying to line up his freeze differently so that a shot for three would be in play if the guard was attempted and missed. 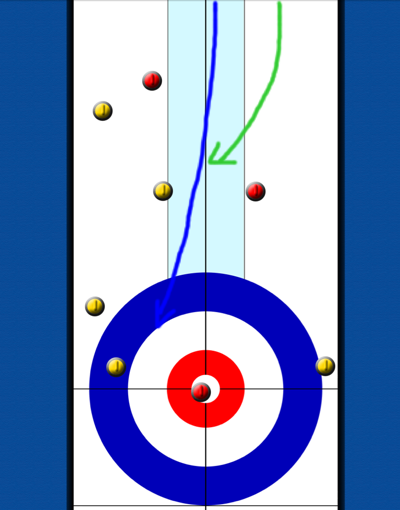 If Gushue had been more on the high side of the rock, some chance this could come in to play, but in all likelyhood Jacobs would see the potential and peel the rock out, possibly leaving himself first and second and still forcing Gushue to one, or even playing a double on the two yellow stones. 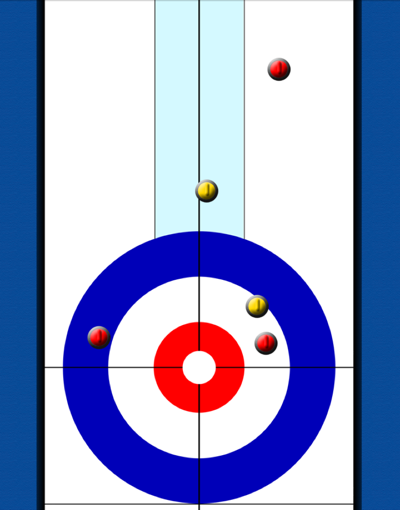 As difficult as it looks, Gushue may have been better to attempt a soft weight double on the red stones with his first shot, roll to the side of the rings sitting two and hope Jacobs is not left with a double. Another option could have been to hit and stick on the back stone, leaving a possible double but chance for two if missed. If Jacobs attempted to hit and stick for two, he would likely leave a double for Gushue. In any case, the shot called and made left them with no chance at two. 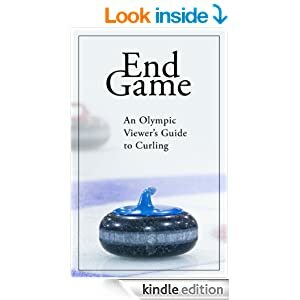 Note: I am attempting to complete a curling e-book in time for the 2014 Olympics. This may reduce the number of words and amount of analysis I am able to generate for next few months. Hopefully my dozen of fans won't mind and it will all be worth it. Someone should take Kevin Martin and Glenn Howard and check the bottom of their feet to find the expiry date. Once again its a Grand Slam and once again we find these two grizzled veterans battling in the finals. Actually, if there is a word for those who are beyond veteran, then Glenn Howard has reached it. "Wise curling sage" perhaps? Checking the mileage under their respective hoods would scare even the most vintage car enthusiast. Consider that Kevin Martin's 1985 Canadian Junior title is reaching its 30 year anniversary. 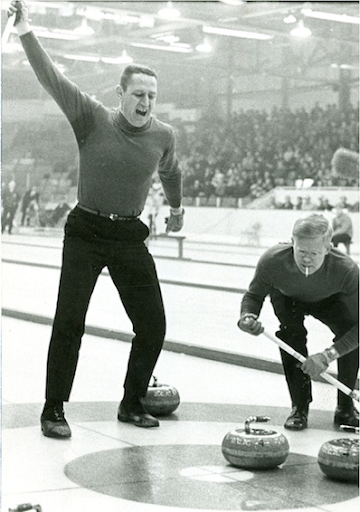 Glenn participated in his first Brier the following year, 1986, at the age of 25. Many of the players on the ice at this years Masters were not around to witness those milestones, they weren't even born. I was watching a fantastic new ESPN 30 for 30 last night, This is What They Want . It's the story of Jimmy Conners miracle run at the 1991 US Open at the age of 39. It made me think of guys like Glenn and Kevin and consider at what point they will become Jimmy Conners in 91, or Tom Watson in 2009, or any spectacular sports story of rebirth which ends in an ultimate disappointment because, frankly, we really can't expect someone at their age winning it all. I'm starting to think in curling, that age may never come. These two are still one of the favourites in every event they enter, including the most difficult events in the world, the Grand Slams. The Brier is tough. The battle to win the Canadian National Championship each year begins with a Provincial competition (for many teams even earlier with regional playdowns). 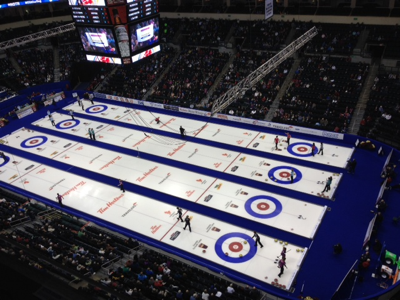 The Brier is a stage that is unlike any Grand Slam event. For the top teams, many of the competitors at a Brier are barely competition at all. Many Provinces simply do not have the elite level teams that can win consistently enough to take the title. Yet the crowds and the excitement can create an atmosphere that is rarely seen and these two have certainly won their share in recent years, (4 of the last 7, with Martin having to bypass an opportunity one year to win an Olympic gold medal). 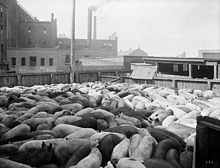 The Grand Slams still have not been able to generate the same atmosphere. It's disappointing to watch this years Masters and still see so many empty seats in an arena for some of the best curling in the world. Bill Russell won 11 Championships with a Celtics team that often playing to a half empty Boston Garden. Maybe one day Kevin or Glenn will also have statues erected and fans will recognize their historic achievements for what they were (still are), incredible. A Grand Slam is the hardest and most difficult event to win. It may not have the grind that is the playdowns to Provincial to Brier to Worlds, but as a single event over an extended long weekend nothing comes close to the level of competition. In the long road to win a World title, great teams more often falter mentally or physically, and beat themselves along the way. In a Grand Slam, you lose if you don't deliver your A game from the first shot to the last. Martin and Howard have won 27 of 49 since 2002 (the modern 4 rock FGZ era). If you add Howard's third Wayne Middaugh and his 5 wins as a skip and Martin third David Nedohin's 3 wins throwing fourth for Randy Ferbey, that's an incredible 35 of 49 or 71%. Only 9 of these last 49 Grand Slam finals have not included one of these four characters. Add your own four letter expletive here. Some day this is going to end. It may be very soon. Then again, for those who keep chasing these guys, it can't come soon enough. It's possible the younger challengers are wishing this sport had never embraced physical conditioning and preparation. If so, maybe Kevin and Glenn would be battling smokers cough and nursing too many CC and Coke hangovers to maintain this elite level. The "next ones" have shown in recent years that their level of play has reached the bar that Kevin and Glenn and their teams have set and they are ready to take over. Maybe just not yet. Note: I am attempting to complete a curling e-book in time for the 2014 Olympics. This may reduce the number of words and amount of analysis I am able to generate for next few months. Hopefully my adoring fan won't mind and it will all be worth it.